The 168 meters long, 20,300 dwt vessel will comply with the International Maritime Organization's (IMO) Polar Code. Because it will operate in the environmentally sensitive Antarctic, Wärtsilä's sustainable technical and hybrid solutions, with high levels of safety and reliability, were considered as being the most suitable for this project. 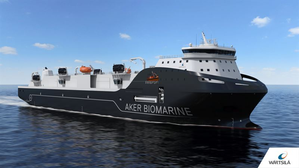 The new vessel will be powered by a Wärtsilä 31 engine, and two Wärtsilä 20 engines will provide the auxiliary power. The engines will all be fitted with Wärtsilä's NOx Reducer (NOR) to prevent nitrogen oxide emissions when in diesel mode. Wärtsilä will also deliver the power distribution system, including hybrid drives and a battery package, the gearbox, controllable pitch propeller and thrusters. A Wärtsilä Nacos Platinum Joystick system will be supplied to enhance the efficiency and safety of the ship's operations. To ensure optimal system performance and energy utilization, the integrated solution is controlled by Wärtsilä's power and energy management system and propulsion control.